A New and Accurate Map of Savoy, Piemont, and Montserrat, Exhibiting the present Seat of War. 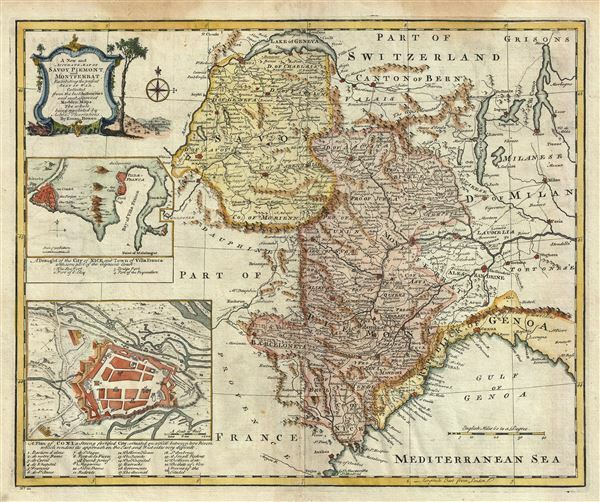 This is a beautiful 1747 map of Savoy, Piedmont and Montserrat in northern Italy. It covers part of modern day France and Italy from Lake Geneva south as far as Nice and east as far as Milan. Several important towns and cities, including Nice, Milan, Turin, Genoa, Geneva, among others are noted throughout. It also identifies several rivers, mountains, lakes, roads and other topography. An inset of the draught of the city of Nice and town of Villa Franca with some part of the adjacent coast is featured near the left border. Another inset in the lower left quadrant features a plan of Coni, a strong fortified city situated on a hill between two rivers, which renders its approach on the east and west sides very difficult. Coni or Cuneo, part of the Duchy of Savoy which later became part of the Kingdom of Sardinia, was an important fortress that witnessed several attack by the French. The region of Piedmont is also famous for a variety of Italian wines. The Barola and Barbaresco wines and the sparkling wine Asti, all come from this region. The map is color coded according to regions and territories and mountains are beautifully rendered in profile. A beautifully illustrated title cartouche is featured in the upper left quadrant of the map. This map was prepared by Emanuel Bowen as plate no. 21 for the 1747 issue of A Complete System of Geography. Very good. Minor wear along original centerfold. Minor damp stains in top and bottom margin, not extending on to printed area. Original platemark visible. Blank on verso. Rumsey 3733.020. Philips (atlases) 614 (1752 edition).